The multi-month increments by International Space Station crews seem to be coming quick and fast these days, with none more quickly than the upcoming Soyuz TMA-08M crew of Russian cosmonauts Pavel Vinogradov and Aleksandr Misurkin and NASA’s Chris Cassidy. When they launch from the desolate steppe of Baikonur, in north-central Kazakhstan, on 28 March, they will spend a mere six hours—as opposed to the standard two days—in “solo” flight, before docking at the sprawling orbital research facility. 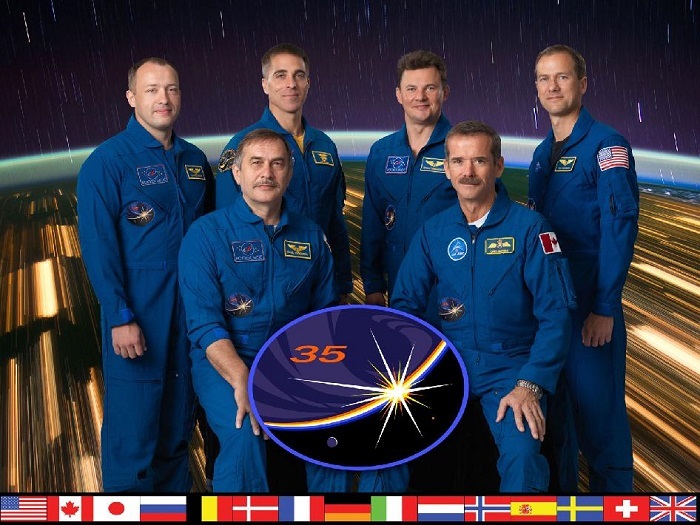 In doing so, Vinogradov, Misurkin, and Cassidy will form the second half of Expedition 35, under the leadership of Canada’s first ISS Commander, Chris Hadfield, and will later constitute the core of the Expedition 36 crew, returning to Earth in September. Having said this, the crew will have the opportunity to move around the cabin, which is rendered somewhat more spacious in the absence of gravity. However, for Cassidy, a U.S. Navy officer and former SEAL, the lack of comfort in the Soyuz is notable. “The toilet is right next to where you sleep, which are right next to your buddy,” he said, “and eating and all; it’s like living for a day in a smart car or a Volkswagen Beetle.” From an operational perspective, the only difference for Cassidy and his crewmates are that the six-hour timeline is much shorter, naturally, than it would ordinarily be, with fewer gaps between discrete activities. The decision to adopt the fast-rendezvous approach for Soyuz TMA-08M was formally agreed by the International Partners last month, but, according to ISS Program Manager Mike Suffredini, has not yet been approved for all future flights. A decision on whether to adopt it for Soyuz TMA-09M on 28 May—whose crew includes NASA astronaut Karen Nyberg—is expected to be made in April. Soyuz TMA-08 arrived at the Baikonur site in January and has steadily progressed through its final weeks of testing, ahead of mating to its booster, a descendent of the R-7 “Semyorka” (“Little Seven”), originally conceived by Sergei Korolev in the 1950s. Approximately a day before launch, it will be transported out to the launch pad in a horizontal fashion, atop a railcar, and there erected into a vertical position. Liftoff is currently planned for 4:43:22 p.m. EDT (8:43:22 p.m. GMT) on 28 March, with docking at the space station’s zenith-facing Poisk mini-research module at 10:32 p.m. EDT (2:32 a.m. GMT on the 29th). The arrival of Vinogradov, Misurkin, and Cassidy will kick off a busy few months for the ISS Program, highlighted by numerous spacewalks from both the Russian Operating Segment (ROS) and the U.S. Operating Segment (USOS). The first excursion is tentatively planned for 19 April and will involve Vinogradov and fellow Expedition 35 cosmonaut Roman Romanenko. When he floats outside the Pirs airlock, Vinogradov will become the world’s oldest spacewalker, soundly beating the previous record-holder, Story Musgrave, who was 58 years old when he supported three EVAs to service the Hubble Space Telescope in December 1993. In his NASA interview, Vinogradov spoke briefly about the tasks he and Romanenko will perform. “It’s going to be for the installation of special sensors and antennas that show the state of the electromagnetic field around the station,” he explained. The cosmonauts will also install material-exposure sample trays and equipment to support the docking, in early June, of Europe’s fourth Automated Transfer Vehicle (ATV-4, named in honor of physicist Albert Einstein). 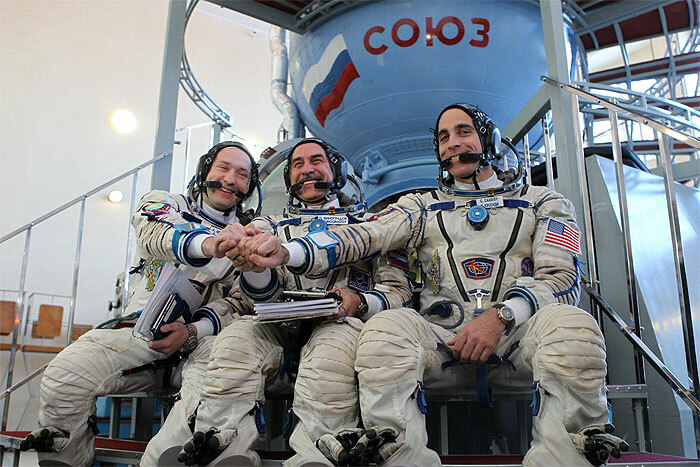 For the first six weeks of their mission, Vinogradov, Misurkin, and Cassidy will work as part of Expedition 35, alongside Roman Romanenko, NASA’s Tom Marshburn, and Commander Chris Hadfield. That will change when Hadfield and his team return to Earth aboard their Soyuz TMA-07M spacecraft on 14 May, after 146 days in orbit. 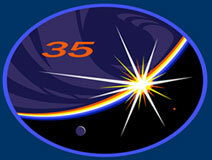 Vinogradov will take command of the ISS and the first half of the Expedition 36 increment will begin. Three new crew members—Soyuz TMA-09M’s Fyodor Yurchikhin, Karen Nyberg, and Italian astronaut Luca Parmitano of the European Space Agency—will arrive to restore the station’s six-person capability at the end of May. Parmitano will become the second Italian long-duration resident of the ISS; in ESA mission-naming tradition, his voyage is called “Volare” (“To Fly” in Italian.) 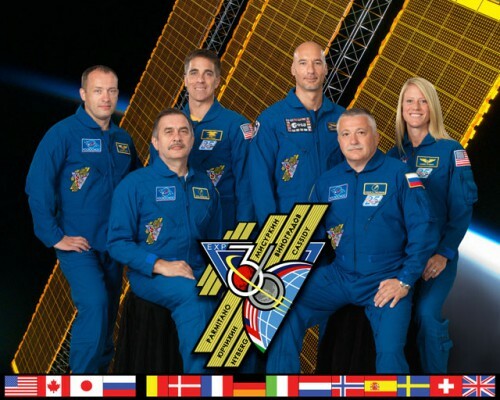 With the exception of Nyberg, this new crew will participate heavily in the EVA schedule over the summer period. In addition to Yurchikin and Misurkin’s spacewalks in June and August, astronauts Cassidy and Parmitano will make at least two EVAs—and perhaps three—in early July. When he ventures outside, Parmitano will become the first Italian in history to perform a spacewalk. Current projections indicate 2 July and 5 July as the preferred dates, with a third tentatively slated for the 9th. “The number of EVAs,” explained Vinogradov, “will depend on how successful they are … but we don’t want to put too much pressure on the crew and give them time to work at a measured pace.” One of Cassidy and Parmitano’s first tasks will be the relocation of a pair of Heat Rejection Subsystem Grapple Fixtures (HRSGFs) from their current home on the station’s Mobile Base System to the outboard S-1 and P-1 trusses. The HRSGFs, nicknamed “grapple bars,” arrived at the ISS aboard SpaceX’s CRS-2 Dragon cargo craft and were robotically removed from the unpressurized Trunk on 6 March by the 57-foot-long Canadarm2 manipulator arm. The purpose of the grapple bars is to provide a capability for Canadarm2 to interface with ISS radiator elements, should the need arise to repair or replace them. The astronauts will remove the bars from their Payload Orbital Replacement Unit (ORU) Accommodation (POA) on the Mobile Base System, and Cassidy expects the work to transfer them to their final S-1 and P-1 locations to require the majority of the six-hour EVA. Elsewhere, the starboard Solar Alpha Rotary Joint (SARJ)—a 10-foot-diameter, 2,500-pound bearing, situated between the S-3 and S-4 truss segments—which enables the solar arrays to properly track the Sun has experienced intermittent difficulties for several years and requires further attention. According to Cassidy, the starboard SARJ has recently shown indications “that it’s taking more current to drive the motor to make them spin, which indicates that maybe there’s some binding or it’s not smoothly spinning around the ring.” The two astronauts will clean and lubricate the SARJ rings, on both sides of the space station, and tend to a Ku-band antenna malfunction and the need to repair a Sequential Shunting Unit. With the drama of the EVAs keeping the entire Expedition 36 crew busy throughout the summer, Vinogradov and his team will welcome a steady train of visitors, including Russia’s workhorse Progress, Europe’s ATV-4 Albert Einstein in June, and Japan’s Kounotori-4 (“White Stork”) in July-August. Although a precise launch date has yet to be announced, the maiden demo flight of Orbital Sciences’ Cygnus cargo craft should also occur during this timeframe. For Vinogradov, Misurkin, and Cassidy, their return to Earth is tentatively scheduled for 11 September. 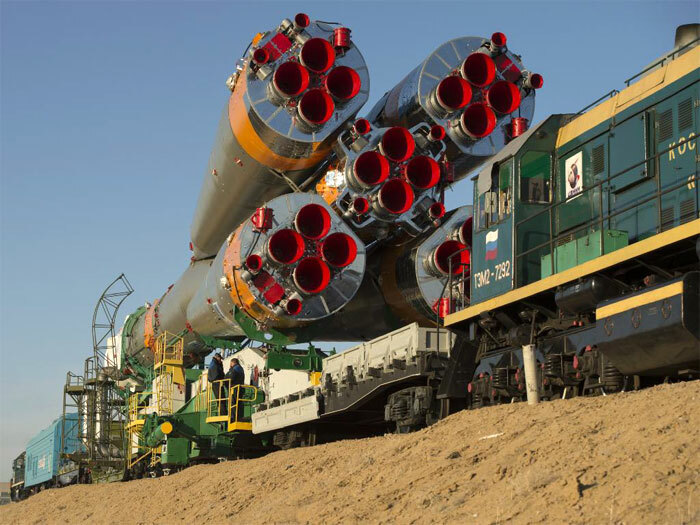 The Soyuz rocket is rolled out to the launch pad by train on Tuesday, March 26, 2013, at the Baikonur Cosmodrome in Kazakhstan. Launch of the Soyuz rocket is scheduled for March 29 and will send Expedition 35 Soyuz Commander Pavel Vinogradov, and Flight Engineers Chris Cassidy of NASA and Alexander Misurkin of Russia on a five-and-a-half-month mission aboard the International Space Station.